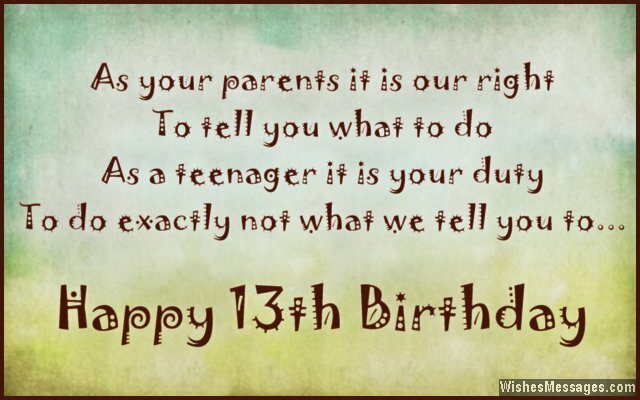 13th Birthday Wishes for Son or Daughter: As parents, choose your words wisely when you wish your child a happy 13th birthday. Don’t sound too serious or boring but don’t dismiss it as something silly either. Subtly weave in some inspirational advice that motivates your 13 year old to give life his or her best shot. Think of what you have learnt from life and put it all together in a wise quote, funny message or a cute note on a greeting card. Celebrate this moment because turning thirteen marks the end of preteen and the beginning of teenage – one of life’s most exciting and beautiful phases. 1) Whenever you feel like you have something to share, just remember that to your family you can lay your heart bare. Whenever you feel that life is being unfair, just remember that Mom and Dad will always care. Whenever you face problems that you can’t bear, just remember that your parents will always be there. Happy 13th birthday. 2) Happy birthday to the sweetest, cutest, coolest, funkiest, brightest and newest teenager in town. 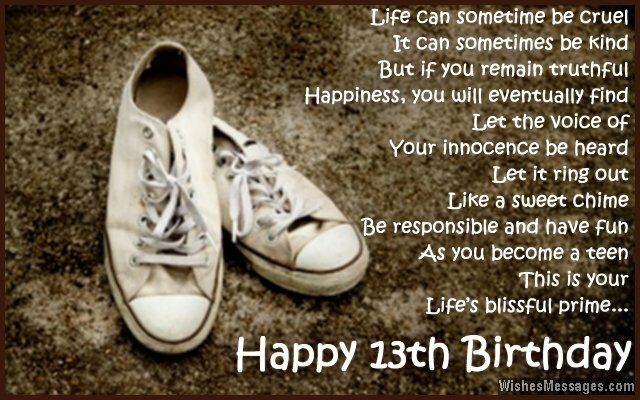 3) How you will live your life when you are 31 depends a lot on how you live your life when you are 13. So work hard, get good grades and be the best teenager the world has ever seen. Happy birthday. 4) Say No to drugs, Say Yes to cute hugs. Say No to alcohol, Say Yes to window shopping at the mall. Say No to stupid boyfriends, Say Yes to having lots of real friends. Say No to lies, Say Yes to family ties. Happy 13th birthday to our dear daughter. 5) You are more mature at 13, than what your father was when he was 18. Hurray for the terrific young boy, who brings to our lives innumerable joys. Happy 13th birthday son. 6) Thirteen is generally considered to be a very unlucky number – unless you get good grades, stay out of trouble and behave nicely with your parents. Happy birthday. 7) You may be old enough to officially use Facebook, but remember that you are not still old enough to get away with posting anything you like. Happy 13th birthday. 8) Let us tell you something that we wish we were told when we were teenagers – be yourself, don’t try to imitate others and never back down after a failure. Just remember these golden words as you ace through your teenage, we wish you the best as you turn life’s new page. Happy 13th birthday. 9) As parent we couldn’t be more proud. As a new teenager, you rise above the crowd. As parents we couldn’t be any more happier. As a new teenager, you are an idol for others. Happy 13th birthday. 10) This celebration is a farewell party for your TWEENS, and a welcome party for your Teens. Happy 13th birthday sweetheart. 11) Hurray for turning thirteen, hurray for a brand new Facebook account. But don’t forget that your parents can take away your laptop any time they want. Happy 13th birthday honey. 12) Congratulations for officially getting the right to be annoying, rebellious and irritating for the next seven years of your life. Happy 13th birthday. 13) Always remember that the three most important things in life can never be superficial and always have to come from within – beauty, love and respect. Happy 13th birthday. 14) Being thirteen is fun but it is difficult at the same time, you see. You will get more rights only when you are ready to take on more responsibility. Happy birthday. 15) Be bold, work hard and set out to be the best teenager you can, but don’t let your inner innocence slip away – this is all I want to say as you turn thirteen today. Happy birthday. 16) Life can sometime be cruel, it can sometimes be kind. But if you remain truthful, happiness, you will eventually find. Let the voice of your innocence be heard, let it ring out like a sweet chime. Be responsible and have fun as you become a teen, this is your life’s prime. Happy 13th birthday. 17) Teenage can be the best or the worst phase of your life depending on how you live it. Focus on your studies, play to win, stick to your goals and don’t take on bad habits. Happy 13th birthday son. 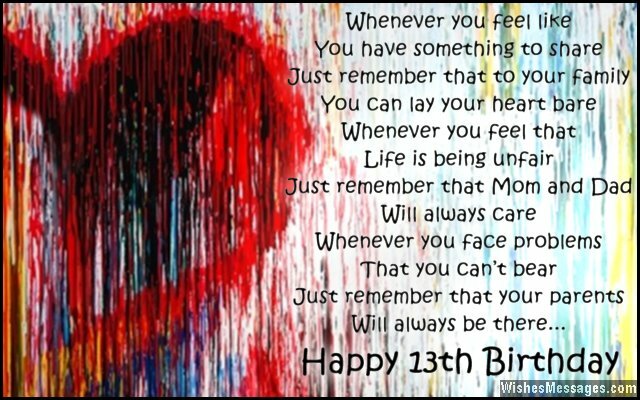 18) We won’t give you any advice on your 13th birthday because we know that you are mature enough to understand the difference between right and wrong. Happy birthday son. 19) You are no longer a little boy, but you are not a big man yet. But with good grades and hard work, there is nothing in life that you can’t get. Happy 13th birthday son. 20) Thirteen is the beginning of your teens. We know you can’t wait to have some fun but remember that even we can’t wait for you to show some responsibility. Happy 13th birthday. 21) You are not just a pretty teen, you are the most beautiful thirteen year old we have ever seen. Happy 13th birthday sweetheart. 22) Teenage life may seem like a never-ending journey to a place so far, but it will all be good as long as you don’t forget who you are. Happy 13th birthday. 23) You were the cutest infant, the most adorable of all toddlers, the most eager preschooler and the bubbliest preteen. If you keep going this way, you will have a wonderful teenage and bloom into a lovely young adult. Happy 13th birthday. 24) Congratulations for finally becoming a teenager but remember that you are still far away from being called an adult. Happy 13th birthday. 25) You may have officially become a teenager but you will still remain a kid for the next five years of your life until you can officially call yourself an adult. Happy 13th birthday. 26) Enjoy your teenage years because they will never come again. But remember to enjoy with responsibility because some mistakes can cause lifelong trauma and pain. Happy 13th birthday. 27) We don’t want to tell you how to grow up because so far you have been an amazing child. All we want to say is – Be honest, Be an achiever. Happy 13th birthday. 28) You have only seven more years to show us that you can be the best teenager in the world. Your time starts now. Happy 13th birthday. 29) Facebook needs to gear up for inviting one of its best members ever. Happy 13th birthday. 30) If you keep working hard in school and never lose your sheen, you will emerge out to be the most successful and the coolest teen. Happy 13th birthday. 31) As your parents it is our right to tell you what to do. As a teenager it is your duty to do exactly not what we tell you to. Happy 13th birthday. 32) Hurray for finally ushering yourself into teenage. As parents we want to wish you with the most important piece of advice – cherish your innocence and don’t be in a hurry to grow up. Happy 13th birthday to our dear daughter. 33) You can officially be a difficult person and give us a hard time since you have become a teenager now. Happy 13th birthday. 34) Until now, I used to call you cute. From now on, I will have to call you handsome. Happy 13th birthday son. 35) There are many 13 year olds in the world right now. But there are few 13 years old like you who promise to live their teenage life with responsibility. Happy birthday son. 36) Farewell to the most innocent years of your life – which you probably won’t remember when you grow old but just think about your preteens will bring a smile to your face. Happy 13th birthday. 37) Daddy wants you to grow up to be a beautiful and honest girl. Mommy wants you to grow up to be a successful and strong woman. Why don’t you combine both our wishes and grow up to be beautiful, honest, strong and successful? Happy 13th birthday. 38) As long as you make school your priority number one, your life will always be cool and fun. Happy 13th birthday. 39) Whether you are thirteen or thirty, as long as you work hard you will always be happy. Son, happy birthday. 40) You may have turned into a teenager but don’t let that change the person within because you are perfect just the way you are. Happy 13th birthday.